Wow this film starts off good! 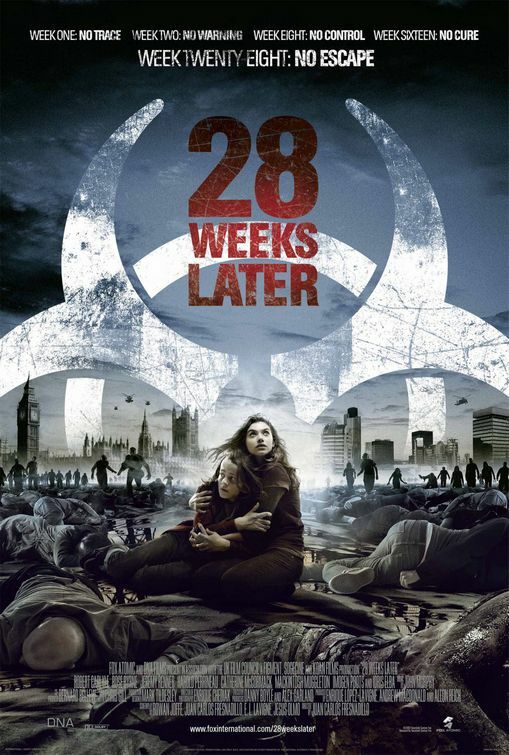 28 Weeks Later started, well, 28 weeks before. Before the starting credits roll, we are treated to a creepy, atmospheric scene, where a few survivors are holed up, trying to survive while outside the Rage Virus is taking over England. We are introduced to Robert Carlyle, Don, who is the de facto ringleader of this group and Catherine McCormack, his wife Alice. Within minutes the zombie-like victims of Rage have attacked, broken into the safe house and eaten most everyone there. Except Don, who has run out of the house, leaving his wife alone to fend off the flesh-eating creatures. And this is all in the first five minutes! We’ve got a protagonist who is a coward, a female lead who’s about to die, shaky camera movements which never allow you to get a firm sense of who is in danger and more blood than any three episodes of “House”. This is good stuff! But then … 28 Weeks Later … and the island of Great Britain is clean of zombies and the UN backed United States military presence is allowing residents to return to one, renovated and rebuilt, section of London. Naturally, things go awry. The eradicated Rage Virus makes a comeback while Don and Alice’s kids (Mackintosh Muggleton and Imogen Poots), who have returned to the city, struggle to survive in a world gone mad. As the film moves along, it becomes a lesson in the difference between filmmakers. While the original 28 Days Later was written by Alex Garland and directed by Danny Boyle, the sequel was made by Juan Carlos Fresnadillo who took over both co-writing and directing duties. Now, Fresnadillo isn’t bad, but he’s inexperienced. This is only his second feature and his first in English and while that’s not necessarily a bad thing, making an American movie is very different than making one in Spain. Here, he makes some rookie mistakes and is rewarded with unintentional laughs for his effort. At the screening I saw, the teenagers around me, admittedly the film’s target audience, were wondering, very loudly, why characters were doing what they were doing … and in a monster film, you should never wonder. The main objective is to stay alive and, unless you’re Danny Boyle, you shouldn’t stray far from that formula. It’s been working for zombie films since 1968 and when Fresnadillo sticks close, his film works like a charm. He’s created some wonderfully creepy set pieces and even manages to throw in some military SNAFUs (although I will leave any type of modern political allegory to smarter writers than myself – but trust me, it’s there if you look for it). When all is said and done, though, Fresnadillo and his co-writers Rowan Joffe, JesÃºs Olmo, and Enrique LÃ³pez Lavigne commit the cardinal sin – underestimating the suspension of disbelief of their teen audience, let alone the adults. Their plot points hinge on unbelievable coincidences as well as plain stupidity on the part of their characters and the audience is not standing for it. As soon as a character does something stupid, twice, we lose faith and stop following the action of the film. Instead, we are now watching for the gaffs and the illogical movements. This is an old problem with teen films (think almost anything they make fun of in the Scary Moviefilms) but today’s audiences are more sophisticated. This isn’t to say the film needs to be smart … it just needs to not be so stupid.